There are a lot of great marketing tools for WooCommerce stores, and coupons are one of them. They can help you get new users, recover old customers or just spread the word about your products. Thus, our goal for today is to understand your coupon users and how they compare to your regular customer base. When it comes to buying products the price versus value dilemma is certainly the biggest concern for most users. Usually customers want to get the best product possible, paying as little as they can. So when you offer discounts or coupons you are certainly tipping the scale in your favor. And once a customer has purchased from you, it’s far easier to reach out to them for repeat purchases. There are many other strategies that you can apply once you know more about your WooCommerce customers who used coupons. Therefore, our goal for today is to gather all the information you can about these users. We are going to see how to use different filters to gather different coupon users. 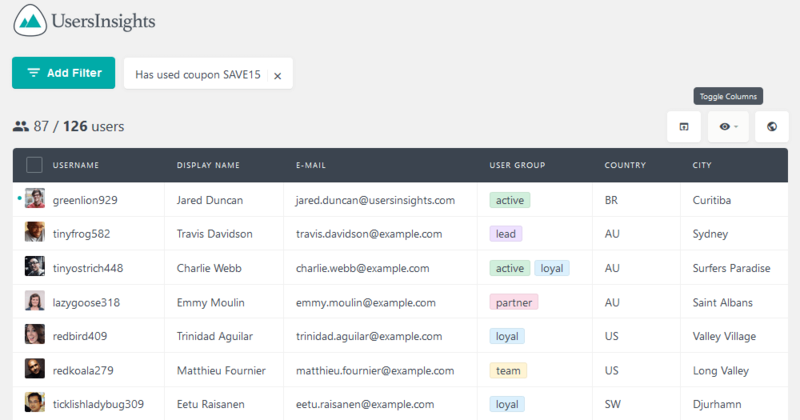 We are also going to see how you can combine different filters for advanced coupon usage reports. Not to mention that we are also going to cover how these customers can be compared with your regular user base. In conclusion, after reading through this article you should be able to fully understand coupons as a marketing strategy. You’ll be able to measure all aspects of it, including the customer satisfaction and return on investment. 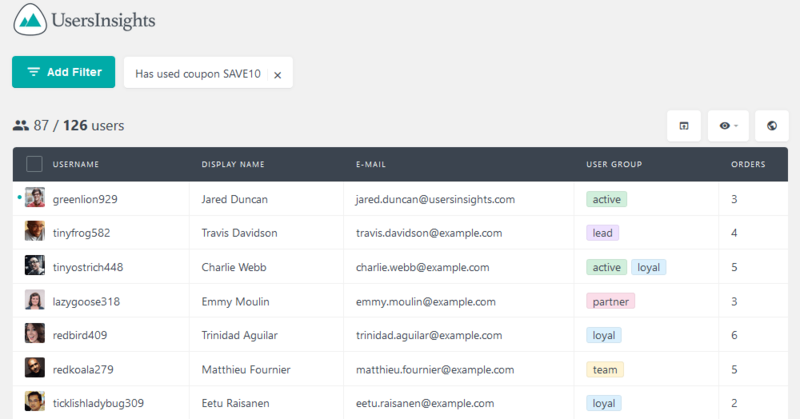 Let’s warm up by getting to know the Users Insights filters for WooCommerce coupons. It’s the “has used coupon X” filter, where X is the coupon name. When applying this filter, you’ll get all users that have used this coupon at some point in their orders. This filter by itself is a good way to quickly see how successful a campaign was. You can compare basic data about these users and other broader user views, such as your average customer. For example, you can compare their lifetime values, number of orders, and any other metric you have at the moment. In addition, this filter is going to remind you how important it is to use different coupons for different campaigns. We know it’s tempting to just reuse the same coupon over and over again, but this means that you might lose a lot of information. When you add coupons with meaningful names you’ll know exactly which campaign it was related to. And that’s the only way to measure results accurately. Therefore instead of just using SAVE10, or similar, try using WELCOME092017 or another unique name that you can trace. Indeed, getting to know where your customers are is very important. And it’s also important even when you are running an online store with WooCommerce. When you set the address-related columns in the results table, you’ll know where your coupon buyers are located. This information is great when you want to quickly glance that, or even export a complete set of your data for further analysis. On the other hand, when using the filters for a location in specific, you restrict your dataset. This is great if that’s an important location for you and you want to understand it a little bit better. These filters can be used for all the WooCommerce address fields and geolocation data, giving you the ability to search coupon buyers through them. Since coupon users are probably happier, it may be a good idea to ask them for reviews. This is particularly true if you know that the discount helped them discover a product that improved their lives. Additionally, this filter could be used to see which coupon users have actually sent a review, and see their opinions. As mentioned before, coupons can be used as a marketing tool. So you could use coupons for creating new relationships with customers, or even give long time customers a new reason for buying. The key to getting to the bottom of this information is to fiilter the inactive users. You can use the last seen filter in combination with the number of orders filter. This is going to tell you which WooCommerce customers have used a coupon and never came back again. A variation of this idea is the reverse: using the coupons to reach out to new customers. So, you can just create a new coupon, reach out to non-customers and send this to them. Afterwards you can measure this campaign’s results. Then you’ll need to use a mailing software such as Mailchimp to reach your users and send the newly created coupon. We have a guide on how to import your WordPress users to MailChimp, in case you need help with that. Undoubtedly the real value of any business-level analysis comes with consistency. A metric means nothing if you aren’t tracking the following days, weeks, months. The same logic applies to marketing strategies such as using coupons for user retention or conversion. You just need to do that consistently and use a spreadsheet software such as excel to compare which values are growing, and at what pace. In today’s article we saw multiple ways to filter your WooCommerce customers by coupon code used and other filtering aspects. From the simplest filters to complex analysis by tracking results over time. Our goal was that the ideas contained in this guide should help you gather more information about your customer base and therefore run a better WooCommerce store. We hope you enjoyed it and see you again next time!